Sign up to receive special insider notifications of deals, promotions, and new items! Hayward Easy-Clean C400 Pool Filter & Pump System C4001575XES. Easy-Clear Full-Flo Element Filter System. Easy-Clear full-flo element filters are designed specifically for above-ground pools of all sizes. Manufactured from high density thermoplastic materials, Easy-Clear will provide years of trouble-free operation. Easy-Clear filters are mounted on a rugged filter base and use a special reinforced polyester cartridge engineered to provide superior water clarity with minimal care. 50 GPM Design Flow Rate. Turnover Rate: 24,000 gal/8 hrs; 30,000 gal/10 hrs. 1 HP Power-Flo LX Pump. Two (2) 1.5x6' Lengths of Hose. Easy-Lok lid access design provides simple entry to service the cartridge element. Built-in check valve prevents accidental loss of pool water when cartridge is being removed for cleaning. Unique safety-catch prevents over tightening of the cover and unwanted entry into the filter. Cartridge element is uniquely designed of high quality reinforced polyester and a molded center core for easy cleaning, high flows and long life. Union connection allows pump or filter to be removed quickly and easily for servicing systems. To make sure we get the order to you as fast as possible, orders are processed as soon as they come in. We cannot guarantee that any order can be cancelled once placed and processed. Included in this but not limited to are Heat Pumps, Gas Heaters, Large Filters, Slides, and Diving Boards. These products are delivered to the front of the driveway, not to the garage or installation site. The trucking company is not responsible to transport your items anywhere other than the front of your driveway. In this circumstance, we will call you with the additional charges. To help make this process as smooth as possible please follow these guidelines. Sign Bill of Lading (receiving bill). This document says that the order has been received. This all states that the order has arrived in good condition. It is the customer's responsibility to inspect all packages received. This document also states the number of cartons you are receiving, please make sure this number is the same as the actual number of cartons received. It is your responsibility to make sure your order is in good condition upon receipt. Backyard Pool Superstore is here for all of your pool and backyard needs. Here at Backyard Pool Superstore, we understand that mistakes can be made. The packaging must be resealed with. See below for more details. When you sign for the product, you state the product arrived in good condition, and you accept the condition it was delivered in. Our staff is dedicated to making sure your experience with us is not only good, but the best! We are not just "Internet retailers", we are pool and backyard professionals that have been in business for over 20 years. We pride ourselves on fast, professional customer service. We use the latest technology to assist you with your pool, spa, patio, and backyard needs. The Best Customer Service and Expert Advice. With many years of experience in all aspects of the pool and backyard industry, we are here to help you with all of your questions. If one of our staff members cannot help you immediately, we will not rest until we find an answer to your question. 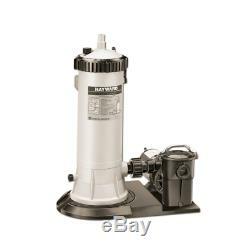 The item "Hayward Easy-Clean C400 Pool Filter & Pump System C4001575XES" is in sale since Tuesday, February 27, 2018. This item is in the category "Home & Garden\Yard, Garden & Outdoor Living\Pools & Spas\Pool Equipment & Parts\Pool Equipment Parts & Accs". The seller is "backyardpoolsuperstore" and is located in Multiple Locations. This item can be shipped to United States.